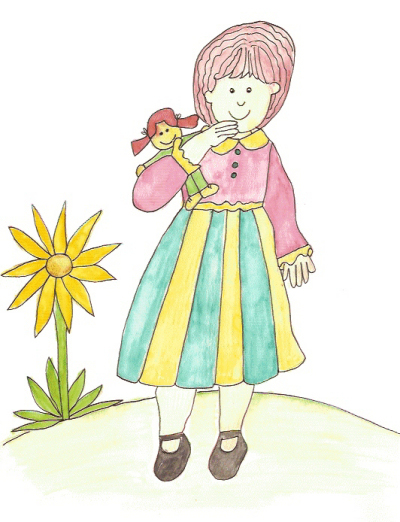 Sally played with her doll, Mary, every day. Wherever she went, she took Mary with her. Both of them had red hair. “Ice cream? I love ice cream!” Sally held her grandmother's hand and they walked down to the ice cream store. Sally had forgotten about her doll, leaving it in the garden. “I want bubblegum with maple pecan.” Sally's mouth watered with the thought. Her mother ordered a bowl of chocolate chip ice cream. The three of them sat at a table, eating ice cream and watching people walk past. When they finished they went back to Sally's house and the three of them watched a movie. “In the garden,” said Sally's mother. “Sally, are you sure you were playing near the roses? I thought I saw you near the sunflowers,” Mother said. Mother and Grandmother chuckled and went into the house. “Yes, I do, and maybe one day you'll see one.” Grandmother winked at Sally. “Maybe I will.” Sally smiled and hugged her doll.